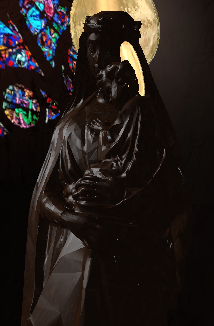 The Medieval History Database (MHDB) reproduces historical sites such as cathedrals, towns, chateaux, and other locations, rendering them in realistic 3D (see screenshots to the left and right). Clicking on buildings or other structures activates a window displaying historical source documents related to that location, such as military records, financial records, and eyewitness accounts. The database thereby links together two types of historical evidence : the written sources and 3D reconstructions of what these locations may have looked like at the time. 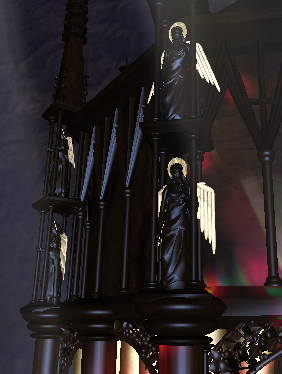 The screenshot at left shows a wooden statue of the Virgin Mary on top of the central turret of the massive, ornate organ at Rheims cathedral in 1429, when Charles VII was crowned there with Joan of Arc by his side. 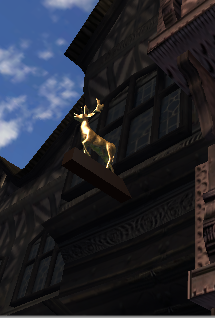 The screenshot at right shows an inn at Orleans, France, with a gilded deer above its door. As an example of how the two parts of the database are integrated: clicking on the street at Orleans called the "Rue des Hostelleries" brings up an account of an English artillery attack on 14 February 1429 which damaged an inn called the "Hostel de la Teste Noire" and killed three civilians in the street outside (see screenshot	at right of the text window overlaid on the Rue des Hostelleries). The database also contains military unit records - troop inspection documents, unit payment records, and the like. 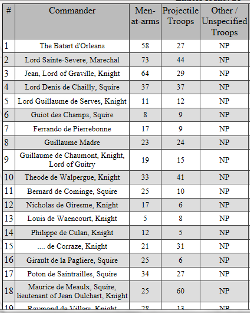 The screenshot at right shows a percentage of the French Royal units which fought at Orleans during the siege, listing the commander and number of men-at-arms and projectile troops (mostly crossbowmen). In many cases, the surviving records are complete enough to allow us to track every small unit as it was deployed from one place to the next or split into sub-units. For example, Henry de Lisle's unit at Orleans consisted of 42 men-at-arms and 129 mounted archers when the unit's contract was renegotiated after his brother and co-commander Lancelot de Lisle was killed on 29 January 1429. The unit was subsequently divided into two sub-units a bit later in the siege after taking further casualties. One sub-unit consisted of Henry himself plus nineteen men-at-arms and 62 archers, stationed as part of the English garrison of Les Tourelles at the southern end of Orleans' bridge. The other sub-unit consisted of twenty men-at-arms and 64 archers and was deployed in other fortresses encircling Orleans. The unit inspection documents often list the names of each soldier, at least for the men-at-arms and projectile troops. This often brings the subject to life in a way that the vague battle summaries in chronicle sources rarely do. This project also attempts to render the 3D models with as much detail as possible in order to create a more realistic appearance. Most 3D software allows the video card to blur out surface textures as the viewer gets closer, since that's what video cards are programmed to do; but this project's software adds tiny details such as wood grain, miniscule bumps, dents, scratches, and the like, thereby increasing the detail as the viewer gets closer rather than the reverse (see the sequence of screenshots at right, which show a sculpture of a lion's head with individual bumps and nicks becoming visible as the software zooms in closer). The following are a selection of screenshots from various 3D models, including Orleans and the cathedral at Rheims as it may have looked in 1429. The latter show an early model of the cathedral's organ, which was substantially different than the one there today. 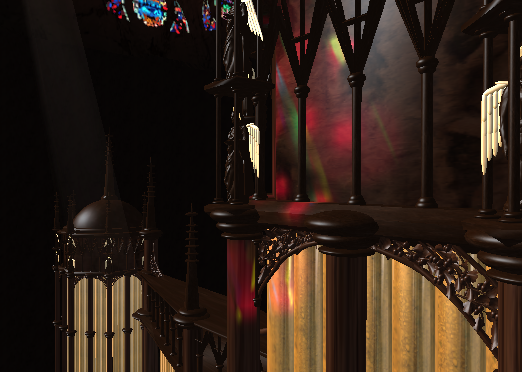 In 1429 the organ had three "turrets" separated by flat panels which were apparently subdivided into two sections at slightly different angles. 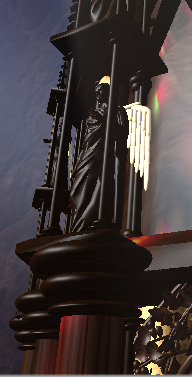 The current organ model contains about 5.2 million polygons, but usually renders at an acceptable framerate even on older computers, although the framerate slows dramatically when the entire organ is in view.